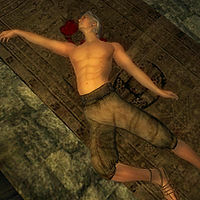 This Murdered Beggar was a Nord commoner who was killed by Raynil Dralas and placed in Bradon Lirrian's basement in order to frame him. His only possessions were a pair of braided leather sandals and belted braies. After you commence the related quest and visit the house, the beggar's body will be removed.